The Rum layered intrusion testifies to modification by injection of hot magma and remobilization of pre-existing cumulate rocks. The Isle of Rum in the Inner Herbrides of Scotland is a classic and much-studied example of an igneous layered intrusion. Dated at 60 Ma, it’s emplacement was related to the development of the proto-Icelandic plume. New work by Leuthold et al. focusses on a particular layer within the intrusion, ‘Unit 9’, which shows a progression from peridotite (olivine-rich) through troctolite (olivine + plagioclase) to gabbro (plagioclase + clinopyroxene). By integrating field and geochemical observations, this study challenges the idea that Unit 9 was formed through progressive fractional crystallization of a single parental liquid. Instead, the authors hypothesise that multiple generations of rimmed clinopyroxenes with sharp boundaries in Cr2O3 and REE indicate that Unit 9 underwent two separate episodes of partial melting in response to the intrusion of hot picritic magma. This upward and lateral migration of melts and the reactive remobilisation of a cumulate pile may be an important process in all layered intrusions and open magma chambers. Can experimental oxygen fugacity be controlled? More precise data is required to determine whether a novel experimental technique designed to control experimental fO2 is effective under H2O-undersaturated conditions. Piston cylinder experiments typically employ noble metals as sample containers due to their low reactivity and high melting temperature. Many years of experimental research has demonstrated that choice of capsule metal often involves a payoff between melting temperature and the ability to control important compositional parameters (e.g., loss of Fe and H2O). Oxygen fugacity (ƒO2) is intrinsically linked to these variables and is a key property of an experiment because it controls the valence of multivalent elements. In turn, this alters phase relations and mineral compositions, and affects speciation of other volatiles elements such as sulphur. 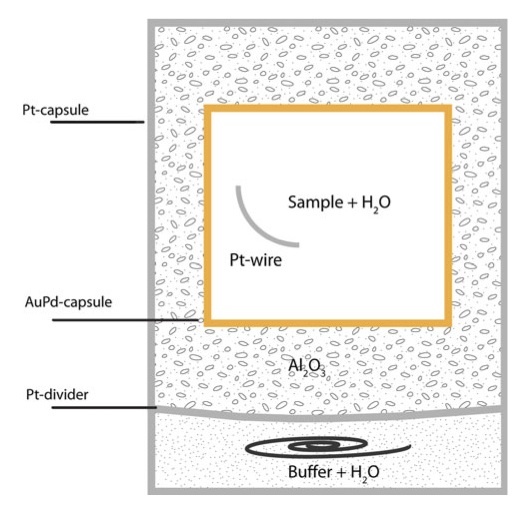 Earlier work by Jakobsson (2012) presented a novel experimental technique for controlling ƒO2 by physically separating a redox buffer from an Au-Pd alloy inner capsule with a hydrogen-permeable barrier. This technique relies on hydrogen fugacity being equal in both in the outer and inner capsule as fixed by the solid buffer; however, the original study failed to take into account the H2O-undersaturated nature of the experimental melts, which actually act to reduce the ƒO2 imposed on the inner capsule. This amendment acknowledges this oversight, and corrects the measured ƒO2 in the original study for H2O-undersaturation. The authors conclude that whilst this sample assembly is capable of controlling fO2 in H2O-saturated runs, more precise analysis of other parameters (such as the activity of Fe and H2O in the melt) are needed to assess whether the same holds true for H2O-undersaturated variants. A new study shows that substitution of aluminium for silicon in clinopyroxene tetrahedra increases during cooling. The resulting local charge balance favours REE incorporation into the crystal lattice. A new study by Scarlato and co-workers shines the spotlight on clinopyroxenes in a trachybasaltic dyke in the Valle del Bove depression on Mt Etna, Italy. Previous studies by Mollo et al. were able to quantify how the the cooling rate of the crystals increased from 0.02ºC/min to 1.13ºC/min from the core to rim of the dyke. 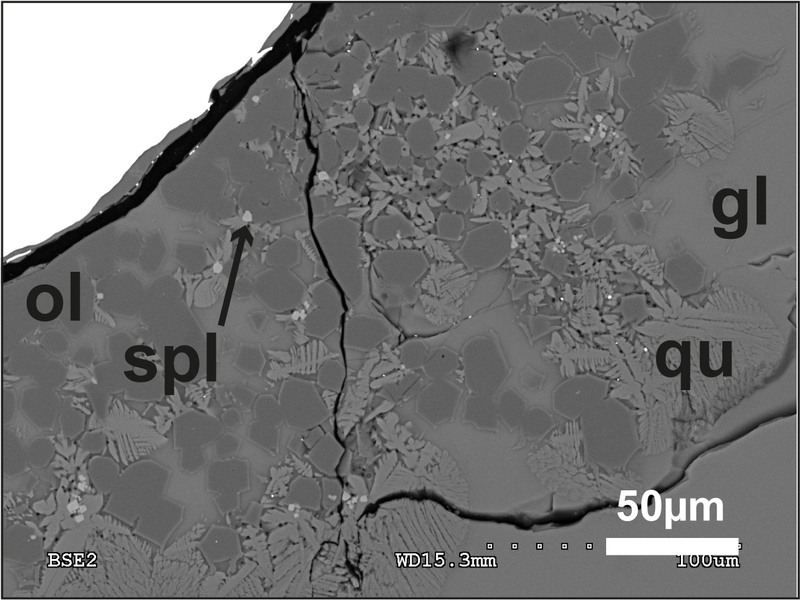 The fact that the solidification path in this igneous feature was already well-constrained provided a perfect platform for this study, which explores the effect of temperature variations on the partitioning of rare earth elements (REE) between clinopyroxene and melt. The structure of the clinopyroxene mineral consists of interlocking silicon tetrahedra, and two sites where metal cations can be incorporated (called M1 and M2). The study found that a higher cooling rate favours the substitution of tetrahedral aluminium (AlIV) for silicon. AlIV acts as a local charge balance for REE ions; as a consequence, REE are more easily accommodated into the M2 site of the mineral lattice. Scarlato et al.’s measurements from this natural laboratory match the theoretical predictions of REE behaviour made using the ‘lattice strain model’ of Blundy & Wood (1994). This demonstrates that the REE partitioning between melt and clinopyroxene in naturally cooled magmas is controlled by local charge balance and cation substitutions, rather than kinetic parameters or diffusion. Cerru Uturuncu, Bolivia, is a continental arc volcano located in the Central Andes. Recent satellite observations of ground deformation in the area have measured uplift of 1 – 2cm per year. This has been accompanied by persistent seismic activity and indications are strong that Uturuncu may be entering a period of unrest and possible magma build up. Inverse modelling of the deformation has indicated a large diameter anomaly at 11 – 17km beneath the volcano. 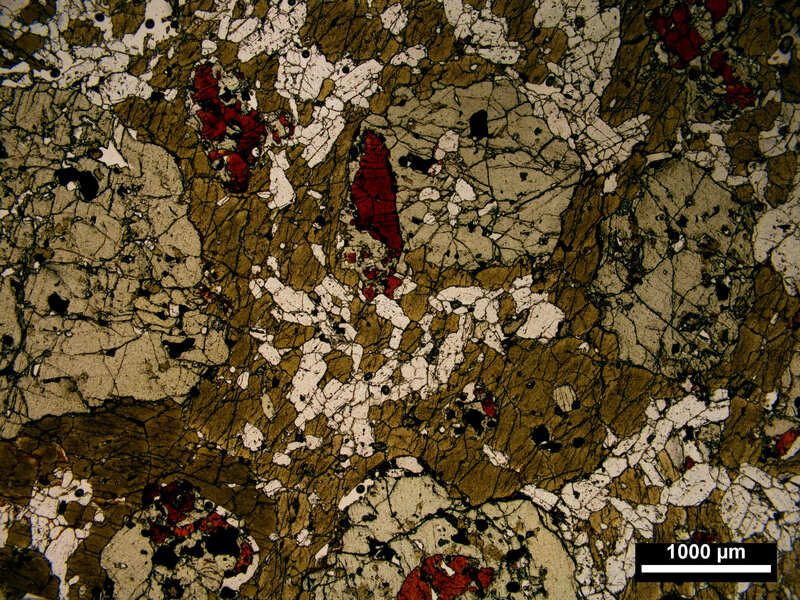 A new study by Muir and co-workers at the University of Bristol conducted high temperature experiments on the two types of lava primarily from the volcano: rhyolite and dacite. The aim of their work to determine if previous episodes of magma storage are consistent with the depth of the anomaly causing the current deformation, and whether future eruptions would likely be effusive (in continuation of past activity at Uturuncu) or larger-scale explosive events. BSE image of an experimentally synthesized dacitic lava. The natural mineral assemblages in both types of lava were replicated by experiments at 870ºC at pressures equivalent to 2 – 6 km depth, a similar crustal level to the location of recent earthquakes recorded at the volcano. This experimental evidence precludes the role of dacites and rhyolites in producing the observed anomaly beneath Uturuncu. 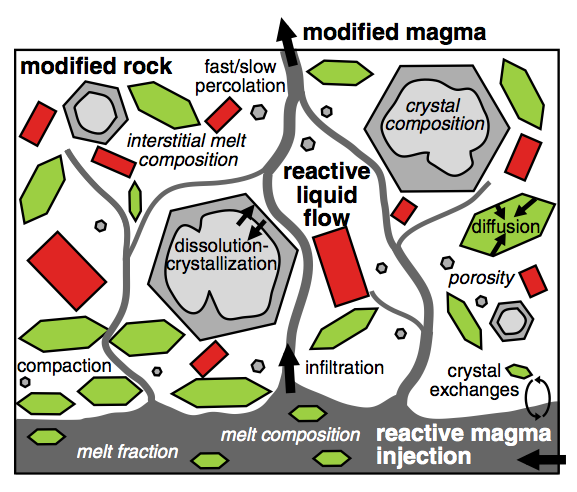 Instead, the authors propose a model where dacitic magmas are formed from fractional crystallisation in an underlying, deeper magma body before stalling in the shallow crust prior to their effusive eruption. A new paper by a collaboration from the Universities of Geneva, Bristol and Savoie quantifies the relative contributions of magma supply, mechanical properties of the crust and magma, and tectonic regime in controlling the frequency and magnitude of volcanic eruptions. The team, led by Professor Luca Caricchi, coupled over 1.2 million simulations of a thermomechanical numerical model of magma injection into Earth’s crust with complex statistical analysis to try and replicate the behaviour of melt beneath a volcano. This work reveals a dichotomy in the causes of volcanic eruptions, which is related to their size. It is known that small, frequent eruptions are triggered by magma replenishment, which imparts stress on the magma chamber walls; eruptions occur when this stress exceeds the strength of the surrounding rock. In contrast, Caricchi et al. demonstrate that bigger, less frequent eruptions are instead driven by the intrinsic buoyancy associated with large magma bodies, a consequence of the slow accumulation of low-density magma beneath a volcano. These findings are particularly important because this is the first time a physical link between the frequency and magnitude of volcanic eruptions has been established. The findings allow the predictions of the scale of the largest possible volcanic eruption on Earth; the work suggests magma chamber can contain a maximum of 35,000 km3 of eruptible magma, translating to an eruption spewing out approximately 3,500 km3 of rock. 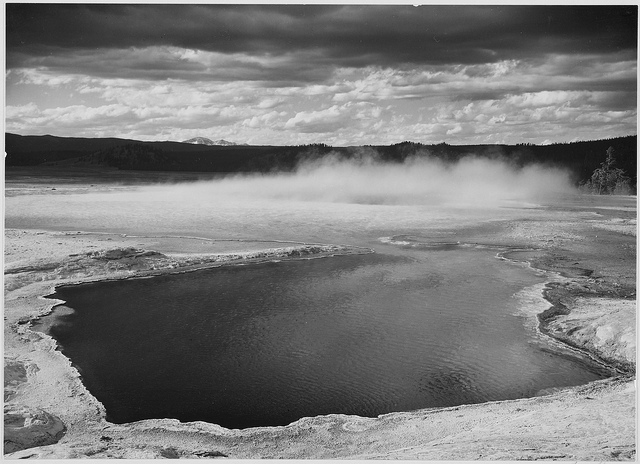 This is three times the volume released during the supereruption of Yellowstone around 640,000 years ago. Caricchi, L, Annen, CJ, Blundy, JD, Simpson, G & Pinel, V (2014) ‘Frequency and magnitude of volcanic eruptions controlled by magma injection and buoyancy’, Nature Geoscience. http://dx.doi.org/10.1038/ngeo2041. Whilst the long-term evolution of a magmatic system may occur over many thousands of years, changes immediately preceding volcanic eruptions may occur on the timescale of months, days and minutes. This kind of resolution is not obtainable using classical radiometric dating, being is constrained by the half-lives of elements. Within the last decade, petrologists have increasingly turned to the technique of diffusion chronometry; here, the blurring in chemical zoning within lava phenocrysts is used to estimate the duration between the last perturbation of the magmatic system and the eruption. The better the resolution of the electron microscope image, the smaller the timescale that can be calculated from a crystal. 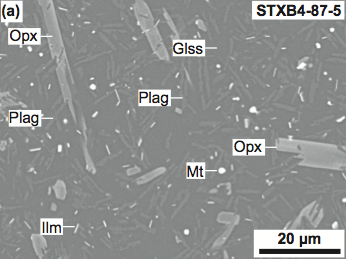 Saunders and co-workers interrogated plagioclase and orthopyroxene crystals from the 1980 eruption of Mt St Helens using the FEG-EPMA at the University of Bristol, a high-resolution electron microprobe purchased as part of the CRITMAG grant. The FEG-EPMA has a beam size of ~ 30 nm, two orders of magnitude smaller than is common in conventional microprobe analysis. This allows collection of both detailed back scattered electron (BSE) images and major element composition. The latter has a quantitative resolution of 750 nm (0.00075 mm), making FEG-EPMA ideally suited for application to diffusion chronometry. The authors also look at two other methods of microanalysis, NanoSIMS and TOF-SIMS, which cannot image samples but have the advantage of being able to measure a large range of major and trace elements at ≥50 nm resolution. Using one, or a combination of the three techniques described in the paper, the authors demonstrate is it possible to obtain chemical profiles of zoned minerals with nanoscale precision. Such detail facilitates characterisation of events that occurred in the months and days before historic eruptions. The Altiplano-Puna Magma Body (APMB), located in the Central Andes, is the largest known continental, midcrustal zone of partial melt on Earth. Fed by mantle-derived hydrous magmas, this volume of molten rock lies directly beneath the Altiplano-Puna Volcanic Complex (APVC), the biggest ignimbrite province generated in the last 20 million years. At the height its of activity, volcanoes in this area spewed out >12,000 km3 of APMB-sourced lava in episodic supereruptions. Previous geophysical surveys have detected the presence of 15-30 % interconnected melt in the APMB by virtue of low seismic velocities and very high electrical conductivity. Del Potro and co-workers investigated how this molten rock travels from its storage zones in the mid-crust (>20 km depth) to the surface by conducting a high resolution gravity survey over the entire area above the APMB. By assuming a homogeneous crustal composition, anomalies in the overlying gravitational field can be attributed directly to difference in density when compared with the surrounding rock. Calculations demonstrate that the measured density contrast is consistent with the crust containing, on average, ~ 25 % liquid by volume. 3D imaging of inversions of the gravity anomalies reveal bulbous, vertically elongated structures of 15 km width rooted at the top of the APMB. The distinctive morphology of the gravity anomalies in conflict with magma transport by dyking, instead supporting a theory of magma transport by diapiric ascent. Evolved melts, buoyant due to high SiO2 and H2O contents, accumulate at the top of the APMB and ascend en masse, undergoing chemical and physical differentiation and stratification. It is notable that the APVC is showing current signs of unrest, as evidenced by large, decade-long, deep-sourced ground deformation at Uturuncu volcano in Bolivi, making Del Potro et al.’s study extremely timely.